Destoryit 2245CC is a perfect desk-side personal shredder. Destroyit 2245CC Cross Cut Paper Shredder is a cross-cut intuitive tool that gives top priority to data confidentiality as well as consumer safety. 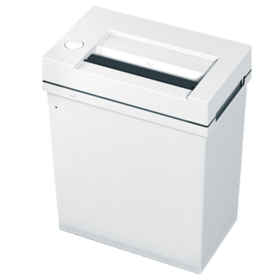 A unique blend of convenience and innovation, the MBM 2245CC is a supreme choice for small sized shredding projects. The built-in solid sturdy steel cutting shafts are capable of shredding paper documents, staples as well as paper clips. The MBM 2245CC embodies a transparent safety flap on top of the feed opening in order to avoid any unfortunate mishaps. Aside from that, the 2245CC also reinforces the concept of consumer safety by shutting itself off automatically if and when the shredder head is removed for emptying purposes. Featuring a single, multifunction control switch with pilot light for stand-by, stop (off), and reverse, the MBM 2245CC is a user friendly, high performing tool. The MBM 2245CC has double protection against overheating and it smoothly carries out quiet and powerful operations. The MBM 2245CC is also a highly suitable choice for users who believe in conserving energy. With zero energy standby mode, this shredder automatically, completely disconnects from the power supply after 30 minutes.